Queen Elizabeth, Leonardo DiCaprio, Jessica Lange and more. The power of makeup is an incredible thing, and one drag queen using that power for good is Alexis Stone, whose Instagram transformations are spectacular to behold. In just the past few months, Stone has used her cosmetic wizardry to become Queen Elizabeth, Lady GaGa, Glenn Close, Jessica Lange, Leonardo DiCaprio and more. Michael Jackson Transformation what's your favourite Jackson song? The Ghosts music video was always my favourite! In addition to the finished looks, Stone also shares videos of her process, which are incredible to watch. 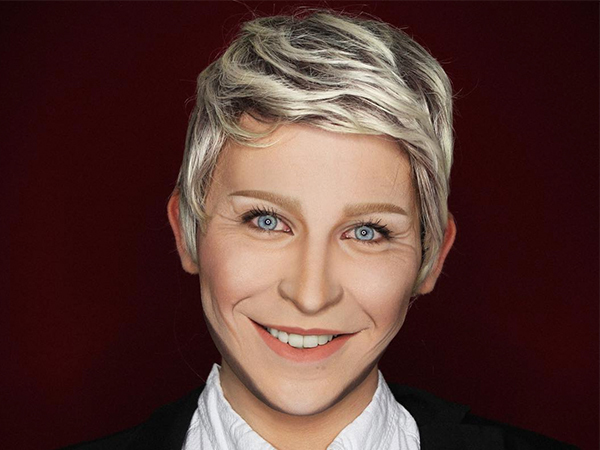 Transformed myself into @theellenshow amazing brushes from @artisbrush lash curlers by @thecremeshop and mascara by @urbandecaycosmetics in subversion and perversion. Let's make sure Ellen sees this! That Ellen DeGeneres look is the spookiest thing I've seen this Halloween season.